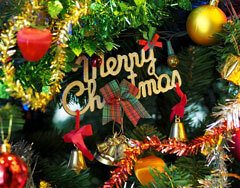 Every year, during the month of December the Christmas season is celebrated in many different ways around the world. Christmas is a religious holiday celebrating the birth of Jesus. Modern secular Christmas traditions have introduced the exchange of gifts among family and friends, Father Christmas, Santa Claus and houses are decorated with lights and Christmas trees. Christmas and Holiday words are hidden in our Christmas Word Search Game. See if you can find all the hidden Christmas words in the game before your points fall to zero. Did you know the word "Christmas" originated as a contraction of "Christ's mass."? There is lots more information you can find out about Christmas.